A Nov. 10 posting, “Progress in the backyard peace process,” described my getting an initially hostile raccoon and possum to peacefully coexist. I had brought them to the negotiating table by putting two piles of peanuts on it. Over the course of several nights, I moved the piles closer and closer together until they were eating side by side. Female possum out to dinner with a male raccoon. A major breakthrough occurred Friday night when the two sides ended up so close together they occasionally rubbed noses as they dined on a single pile of peanuts. Both trod lightly around each other, but there was no snapping or growling. In contrast, the same raccoon got into three fights with other raccoons the following evening, suffering a painful bite to a front paw during one brawl. I’m sure all this reveals something about the difference between inter-species and intra-species relations, but I don’t know what. Turning to international diplomacy, a posting on Jan. 23, “Disconcerting standup reporting,” described al Jazeera correspondent Prerna Suri in New Delhi reporting on India and Bangladesh rekindling ties. The standup comes a short way into her report. What makes her standup so disconcerting is that she appears to be in the middle of a New Delhi expressway with cars whizzing past her on both sides. 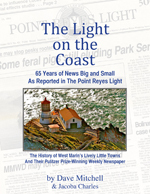 Commenting on the posting, professional cameraman Mark Allan of Inverness Park noted he had shot similar standups on a curb at Lombard Street and Van Ness Avenue in San Francisco. By shooting with a long lens, he said, the traffic seemed closer than it really was. 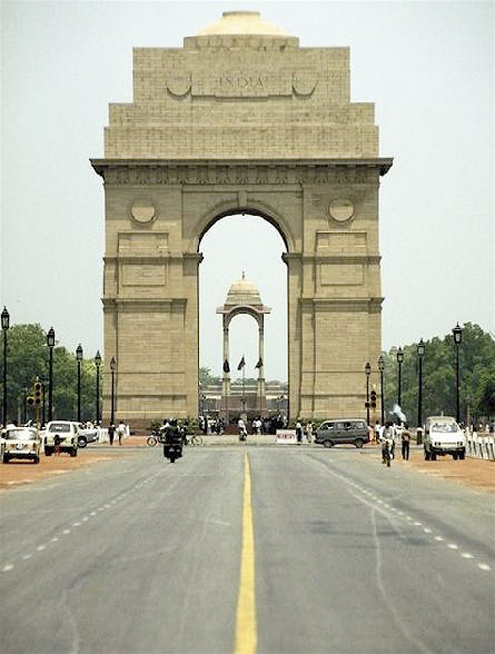 The capital’s 140-foot-high India Gate is a monument to the more than 80,000 Indian troops who were killed in World War I, fighting for the Allies. Meanwhile, the posting on Prerna’s standup has drawn interest from around the world. In the past month, far more readers have reached this blog by Googling Bangladesh India standup report than any other topic. Now for followup reports on the undiplomatic front. The Point Reyes-Petaluma Road saw two more instances of vehicles running off the road last weekend. In one case, a vehicle ran off Highway 1 just a few feet north of the two roads’ intersection. Neither mishap was as dramatic as the one reported here a week ago when a Porsche on March 5 sailed off an embankment at the first curve immediately east of Point Reyes Station. The sportscar flew 50 feet through tree branches and dropped 25 feet to the ground. Driver Joshua Moore, 38, of San Rafael miraculously escaped without injuries when the car landed on its wheels. In far less dramatic fashion, a black Toyota Corolla ran off the roadway at Four Corners (the intersection of the Point Reyes-Petaluma Road and Nicasio Valley Road) shortly before 6 p.m. this past Saturday. The car came to rest against some willows in a gully southeast of the intersection, and neither of the two occupants was injured. However, the Highway Patrol arrested the driver, Arthur V. Gomez, 36, of Fairfield, for allegedly driving under the influence of alcohol. The next day, another vehicle ran into a ditch on the north side of Highway 1 at the Point Reyes-Petaluma Road. A 25 mph sign was knocked down in the mishap, but no injuries were reported, and authorities were not notified. By Monday, the sign was back in place. Sparsely Sage and Timely is powered by	WordPress 4.9.10 and delivered to you in 0.408 seconds using 52 queries.